Currently viewing the tag: "Superior Tool"
If you read this site, you probably spend a lot of time wondering how they put things together, or better yet, how you’d take them apart. Take a tub drain, for instance: How do you remove the old one so you can replace it? Superior Tool makes a tub drain wrench like this dumbbell wrench to help you get the job done. A basin wrench will help you get at hard-to-reach nuts, especially up behind sink basins, but not everyone has the room for an extra wrench in the toolbox. 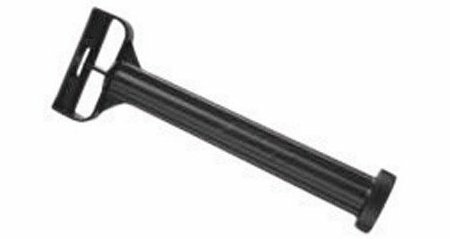 Superior Tools makes this 3/8″ drive attachment that turns your ratchet into a basin wrench — and you can make it any length you need by changing extensions. 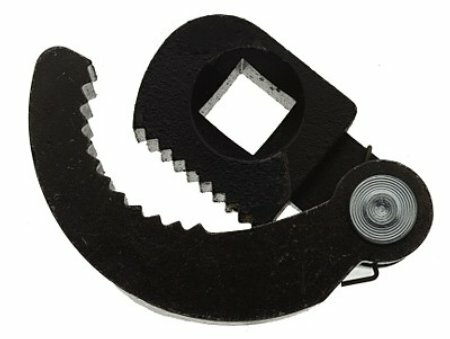 The spring-loaded jaws fit 1/2″ to 1-1/4″ hex and square nuts and anything in between. You can find this basin wrench attachment for about $12 at Sears. While the Gordon wrench will help you turn stuck shutoff valves, to reach the valve you still might have to bend like a contortionist. Plus you probably don’t want to venture that close to the scummy area behind the toilet or under the sink. Although the WaterShutOff wrench from Superior Tool may not let you apply as much torque on stuck valves, it can keep you 11″ farther away from all that unpleasantness that hasn’t seen the light of day in years. You probably won’t see a couple of plumbers in the back room with a bunch of these tools and a playground ball, trying to get twosies — but it’s fun to imagine. These jack-lookalike tools are actually drum tap wrenches for removing cleanout plugs.